Can you see? Can you see it?!? The basil is starting to grow!!! Either that, or its a weed (probably the latter knowing my luck). This is very exciting for me, as I have a habit of killing any and all plants that cross my path. Be warned people - if you give me a house plant, expect it to leave the realm of the living within the month. For now though, the seeds appear to be surviving despite the odds - I may actually have herbs on my windowsill soon! Oh, happy day. 59 books. Wow, is that right? Let me count again... yep, 59. Dude, that's a lot of books. Guess you could say I like reading ;-) And people think I'm hard to buy presents for. Pfft. There's a bit of variation in there, although I notice there's quite a few romances (oh dear). One author I got to meet in person (Lauren Kate), a few more I'd like to meet in the future (Diana Gabaldon, Charlaine Harris, Terry Pratchett, Stephanie Pearl-McPhee and (ahaha) Richard Castle). 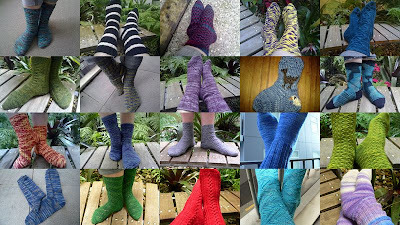 One, I have knit in a competition with (Ros Clarke - Sock Madness). So many good books!! So many more to read!! Hooray for a new year!! 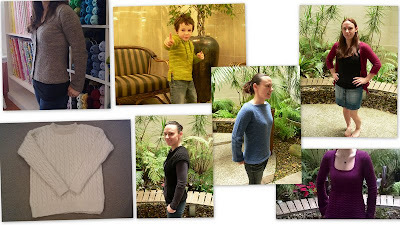 Unfortunately, in order for the blog to not have a hernia and be able to actually upload the collage, I had to make it kinda small, so now you probably can't see much. 19 pairs of socks, and a mini sock. Plus 27 other miscellaneous items (and an extra Deane head). 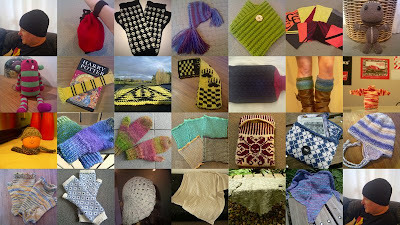 Hats, mitts, shawls, toys, a freaking huge afghan... I do love me some variety. 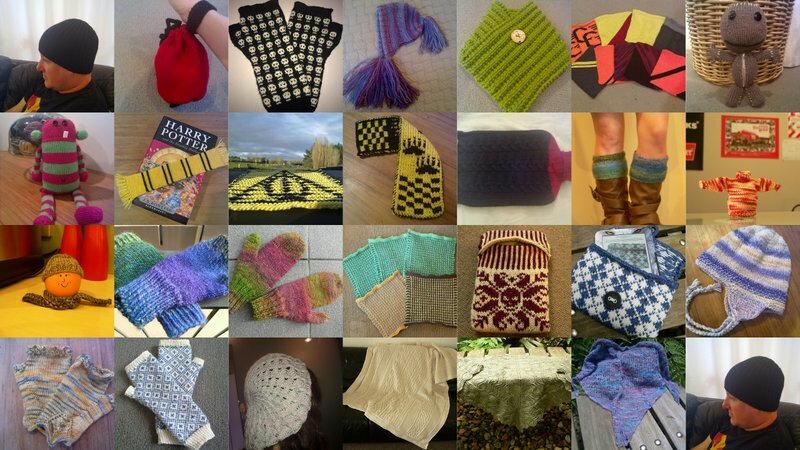 That's a total of 54 different projects, not including the three I didn't get pictures of - a Milo vest, a vanilla soaker, and some blanket squares for the Christchurch earthquake appeal. Phew! 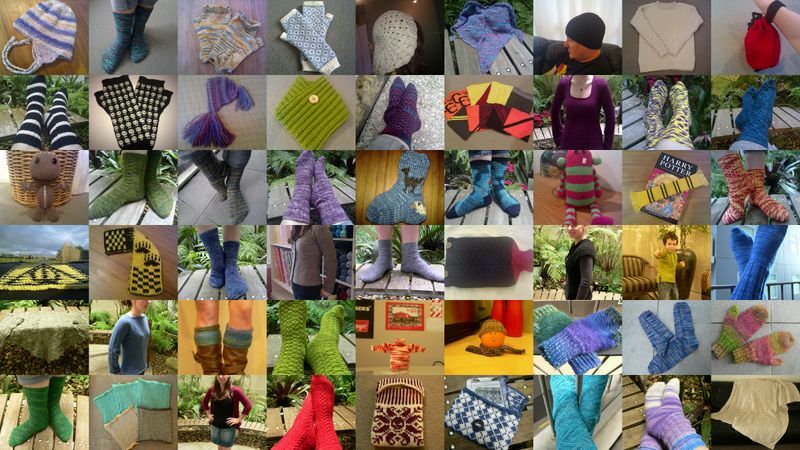 That's a lot of knitting. This is a shawl for my mum - the pattern is Yvaine, knit in Knitsch sock yarn from the last yarn club, 'Terry's Treat'. Also in 2011, I completed a quarter marathon (officially, plus a few more unofficially), ran a 15km, saw my boys turn seven and nine, got to read two of the best end of year school reports a mum could ever hope for, moved into a house with room to stretch out a bit (something we haven't had for quite a while, let me tell you! ), and celebrated 11 years of marriage to the most infuriating, hilarious, caring, dorky, reliable, unreliable (yes, I know, very confusing), thoughtful man, who has come a long way since his teenage boy-racer days. It's been a wild and crazy ride watching him grow and change over the years. This year will see my oldest son turn ten (oh my! ), and who knows what else? I can't wait to find out. Onwards, 2012!!! OMG! Look at all those socks! I am in awe. 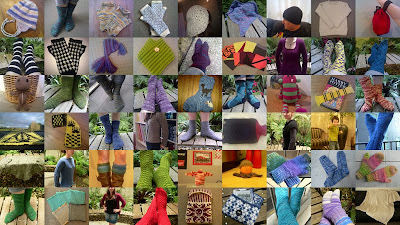 I reckon you've knitted as much as me, if not more! Awesome.